Antibiotics are medicines used to treat infections caused by bacteria. Bacteria are micro-organisms or ‘germs’ that can live both inside and outside of the body. Some bacteria are harmful and cause infections, while others are harmless or beneficial. Several different types of antibiotics are available but perhaps the best known is penicillin. Can I get antibiotics online? 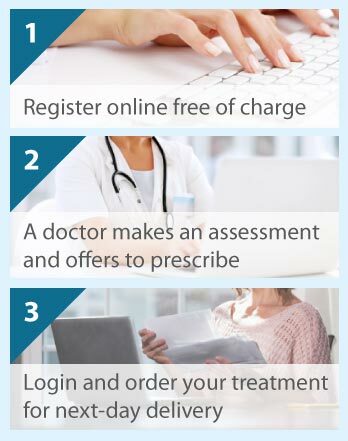 The Online Clinic can prescribe antibiotics for a range of infections if it is justified. Please complete and appropriate medical questionnaire by clicking on the Free Consultation button below. We can arrange for antibiotics to be prescribed for next day delivery. Antibiotics are available on prescription for more than one type of consultation. Our body's defence (immune) system usually copes with harmful bacteria by destroying them, and therefore protects us from getting infections. However, sometimes the infection is too great and antibiotics are needed. Antibiotics work by either killing the bacteria (by interfering with the construction of the bacterium's cell wall) or by preventing the bacteria from growing and reproducing (by interfering with the bacterium's production of proteins). After stopping growth and reproduction, the body's immune system then destroys and removes the bacteria. When should antibiotics be used? Antibiotics are very effective against a wide range of infections caused by bacteria, including skin and wound infections, eye infections, some ear, throat and chest infections, bladder infections, and some sexually transmitted diseases (e.g. chlamydia and gonorrhoea). Antibiotics are also effective against some parasites. However, antibiotics are not a remedy for all infections. They will not work against viruses that cause infections, such as the common cold, flu (influenza), bronchitis, and most sore throats, coughs, and ear infections. Antibiotic use is not always justified based on presentation of symptoms alone. For example, most chest infections are self-limiting and will ‘burn themselves out’, while fever or a change in the appearance of a nasal discharge alone does not justify the use of antibiotics (they may be caused by a viral infection). Importantly, antibiotics taken for a viral infection will not make you feel better and can contribute to antibiotic resistance. Persistent symptoms may not even be an infection, making a consultation with a doctor essential. Your doctor will know when you require an antibiotic and will not be persuaded to prescribe them if they are not necessary. How should antibiotics be used? Always take antibiotics exactly in the way your doctor has advised. Importantly, always take the full course of antibiotics - do not take an antibiotic for a few days only even if you feel better or the infection seems to have gone, as not all the bacteria may be destroyed and the infection may recur. You can read more about antibiotics on the NHS website. When antibiotics are used inappropriately or overused, bacterial infections can become resistant to antibiotic treatments. This means that the treatment is no longer able to get rid of the infection. It also means that there is an increased risk of complications (even death) and spread of infection. Each antibiotic medication has its own side effects. Generally, side effects such as nausea, vomiting, diarrhoea, and abdominal discomfort may be experienced by some people. Others may have an allergic reaction, such as a rash, itchiness or breathlessness. If you have persistent or worsening side effects or suspect you are allergic to antibiotics then tell your doctor. It is also worth noting that antibiotics are not specific - they will also destroy the ‘good’ bacteria that normally live in the body such as those in your intestine. If you have an infection, your doctor will carefully consider your case and balance the benefits and risks of treatment before prescribing antibiotics.